The eastern province can book their place in the knockout stages with a win. Sexton managed 55 minutes against Zebre last week. LEINSTER HEAD COACH Leo Cullen has named Johnny Sexton and Jamie Heaslip in a strong-looking team to face Montpellier tomorrow night in the European Champions Cup at the RDS (KO 7.45pm, live on Sky Sports 2). In total, there are five changes from the team that demolished Zebre in the Pro12 last weekend, as Cullen’s side aim to become the first team to secure qualification for the knockout stages of this year’s competition, with Sean O’Brien missing. There is one change in the backs, with captain Isa Nacewa returning. Sexton is included after suffering no adverse effects from last weekend, which will also be welcome news to Ireland coach Joe Schmidt with the Six Nations on the horizon. In the back row, only Jack Conan maintains his place but he is forced to move to blind side flanker due to Heaslip’s return. Josh van der Flier, who missed out last weekend’s fixture through illness, comes in at openside. In the frontrow, Jack McGrath and Tadhg Furlong also earn a recall. 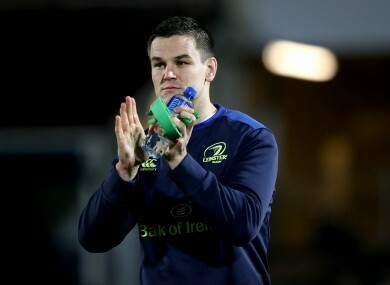 Email “Sexton and Heaslip included to face Montpellier but O'Brien absent for Leinster”. Feedback on “Sexton and Heaslip included to face Montpellier but O'Brien absent for Leinster”.